I wrote the following article for ConservativeHome about the left’s claims that London’s housing shortage is fueled by empty homes. Housing is the biggest long-term issue facing the government and facing the Conservative Party. It’s right that the Government gets to grips with it and, in the form of the White Paper released earlier this year, it’s doing more than any government has done in three decades. But amidst all this policy is the politics and, despite having no workable policy solutions themselves, Labour feel they’ve got the Conservatives beat. Their broken promises and self-serving misrepresentations of our housing market have given them a big lead in London that threatens to spread more widely. One of the great myths that Labour trot out is that foreigners are snapping up homes in London and leaving them empty, reducing housing supply and increasing both the cost of buying and the cost of renting. This narrative has been used to justify higher taxes on property – whether the Lib-Lab ‘Mansion Tax’, Labour’s renewed ‘Land Value Tax’, or ever-higher Council Tax: calls that have become even louder in the wake of the Grenfell tragedy. Jeremy Corbyn even demanded that the government seize empty homes in Kensington and Chelsea. Housing seems to turn the Left into frothing-at-the-mouth xenophobes. And like true xenophobes, this has left them immune to the facts – because their narrative is simply not true. As the Guardian reported in 2014, the UK has far lower levels of vacant properties than any comparable European country, with one-third as many empty homes as Germany, France, or Italy. 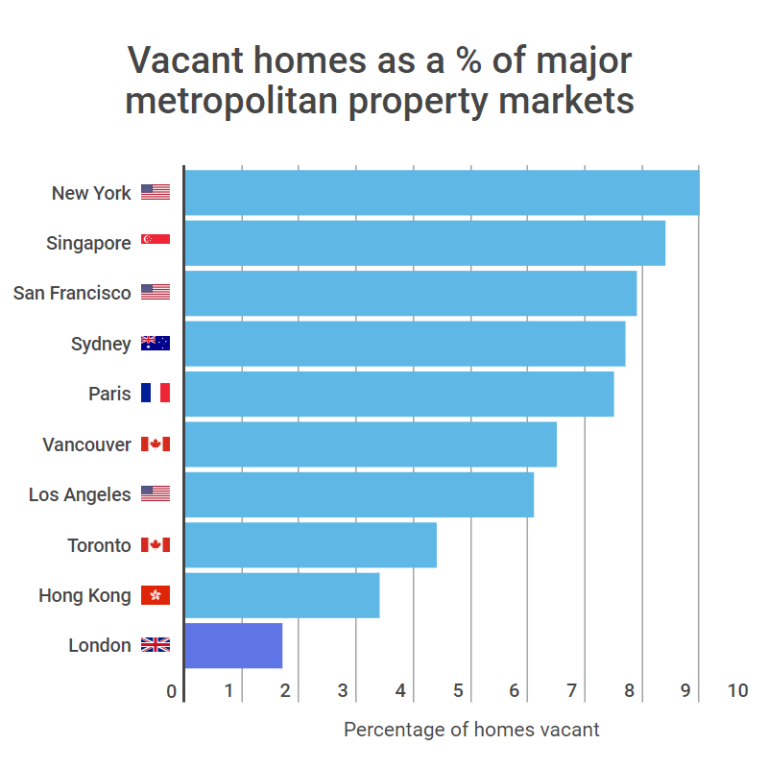 Even in cities, London comes out far better than its global rivals – in part because of its economic success – with homes in London one-fifth as likely to be empty as in New York, Paris, or Singapore. Which of the cities below looks like it has a problem with empty homes? If you listened to Labour, you’d think all of Kensington or all of Hampstead – part of which which I represent – is a ghost town, but nothing could be further from the truth. Yes, the odd property here or there attracts attention, but in total, just 0.6 per cent of London homes – and 0.8 per cent nationally – are vacant for more than six months. That’s down hugely in recent years – in 2010, it was almost twice as high. That’s 15,000 fewer homes empty in London – and 100,000 fewer across the whole of England – than when Labour left office, and that’s worth celebrating. Let’s say, though, for argument’s sake, you could reduce it further – by seizing, McDonnell or Maduro-style, every single empty home. That would make available fewer than 20,000 homes in London: just eight months’ worth of new homes at current housebuilding rates (and about three months at the rate Sadiq Khan promised – but is failing – to build). A solution to our housing problems, it is not. Of course you couldn’t do that even if you were the most antiquated Trotskyite troglodyte with no concept of property or propriety. Except holiday homes, most homes left vacant for a long period fall into one of three categories: either the previous occupant is in care and has held on to their home, the previous occupant has passed away and it’s been stuck in probate, or such significant work had to be done to the property that it requires more than six months of renovation. As such, it would be deeply unfair to raise taxes on empty properties, when vacancy primarily reflects either misfortune on the part of the occupant or investment in the housing stock: something we should all welcome. Indeed, the councils that get it in the neck most for their housing schemes are often the ones with the very lowest vacancy rates. Wandsworth and Westminster are two key examples: both in inner London and – in Wandsworth’s case –- replete with new developments (Wandsworth has built over twice as many new homes as Camden’s Labour council since 2010). Those boroughs have seen falls of 83 per cent and 67 per cent respectively in the number of empty homes since 2010. In Wandsworth, just one home in every 600 is vacant for more than six months: one fifth of the national average. But if you’d read the Guardian’s breathless reporting of Wandsworth’s riverside developments, you’d think that ratio were the reverse. Of course, Grenfell took place in a borough that is unique in many ways. 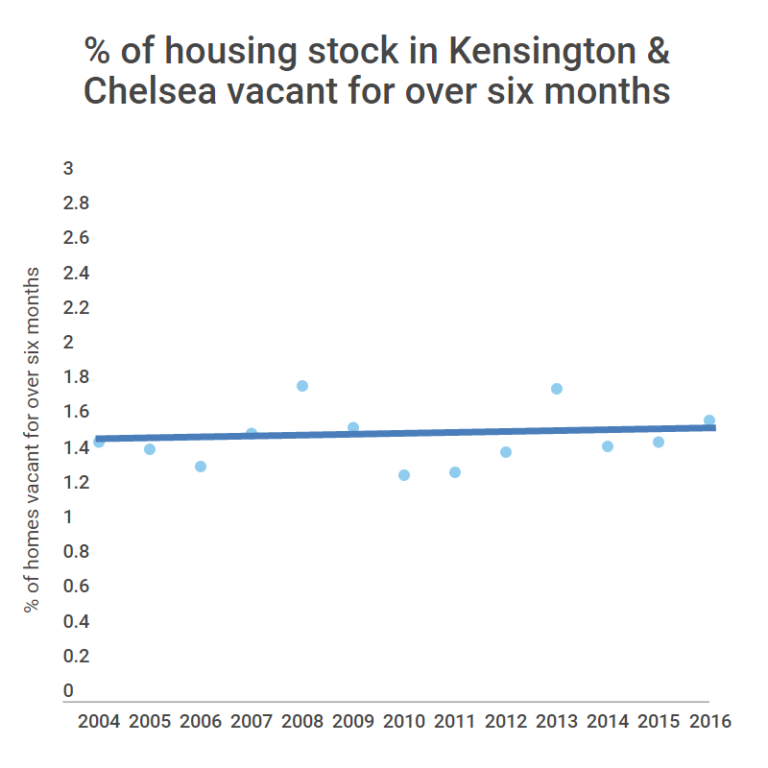 Kensington & Chelsea has more vacant homes than the average London borough, but this isn’t a new thing. Since 2004, the proportion of vacant properties in the borough has remained almost exactly static. True, it hasn’t fallen – as it has elsewhere – but to pretend that communities are being hollowed out by predatory foreigner buyers is incorrect and irresponsible. There are a lot of things that the government can do to make our housing market work more effectively. Stamp Duty still makes it unnecessarily difficult to downsize, and thus means some houses are underused. Slow probate proceedings mean homes stay empty for too long. But Corbyn and McDonnell’s fantasy of seizing homes is no match for the only real solution to a housing shortage – to build more homes. It’s up to us to challenge Labour’s lies and provide policies so we can solve the problem that actually exists.